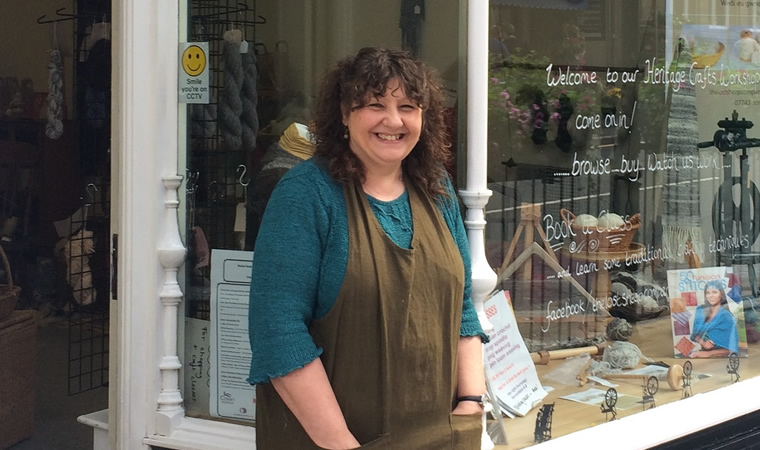 We’re proud to announce that Chrissy Smith, who runs The Lost Sheep Company, has been nominated for Colwyn Bay’s High Street Hero! Chrissy was one of the first traders to have a space at the Pop Up Shop, 24 Station Road, when it first opened, and after a year of successful trading Chrissy moved round the corner to 20 Conway Road where she’s based now. The Lost Sheep Company sells wool from Welsh rare-breed sheep made by Chrissy herself alongside knitting and spinning products. The shop is also a hub for people to come and learn knitting and weaving techniques from Chrissy in one-to-one workshops and larger classes. Chrissy has also started a heritage project where people are encouraged to share their stories of yarn and of the local area. Other nominees are The Bay Gallery, Bargain Booze and Subway, Colwyn Bay Pet Shop, Matthews and Son Hardware, Alpha Business Centre Ltd and Conway Road Post Office. You can vote by picking up a copy of The Pioneer, and sending in the voting slip in the paper to the Pioneer Offices.